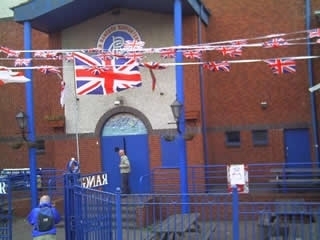 Rangers Supporters Club on the Shankill Road. Have you got Google Earth on your computer? If so, then download the Google Earth view of Rangers Supporters Club. Is this the wrong position for Rangers Supporters Club? If you think so, then modify its position. Click / Tap the button above to get directions from where you are to Rangers Supporters Club. we had a ball with Billy, Big Matt and wee Dickie, made to feel very welcome! cant wait to visit again!! Totally crap club full of little airheads you know the type (aye oright mate) < big men before their time sort with their little baseball caps to keep the **** warm in their heads. great club plenty of singing and noise. also we were made to feel very welcome . best wishes to all the people we met. does any1 know if thers anythin on in the club on the 12th nte? need to change their groups same people every week gets boring after a while. Great place to spend a few hours, and the girls are gorgeous! It is a dirty dump! Very unimpressed with the skanky looking staff, it felt like we were in a chavvy bar fit for Vicky Pollard! It is a while since I have been. Very clean and well decorated. Limited food menu but there is a chippy just around the corner if you are really hungry.